The US Congress has approved plans to force broadcasters to switch off their analogue television signals by 2009. Setting a date of 17 February 2009 was called a "great technical revolution" by Republican politician Joe Barton, a main advocate for the change. Congress has allocated $1.5bn (£844m) to ensure Americans can convert their TV sets to receive digital signals. 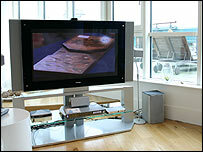 The analogue television switch-off in the UK is set to take place gradually from 2008-2012. The US measures, which were part of budget legislation, were passed in December, but Democrats in the Senate forced technical changes to the bill. Moves to bring about the end of analogue broadcasting in the US have been under way for years. Under existing law, broadcasters would be required to cease analogue transmissions when digital TV reaches 85% of the population, but this is a threshold which is not expected to be reached. Under the new digital conversion programme, each family will be entitled to $80 (£45) towards the cost of a set-top box. In the UK, BBC Two is to become the first station to go fully digital ahead of a full switch-off of analogue signals. More than 60% of households already watch digital TV, while government help has been pledged for those aged over 75 and with disabilities towards the cost of conversion.